I have always been on the ‘chubby’ side and have constantly been on some diet for weight loss. They all worked – except that when I went back to eating regular/normal food, I gained the weight back gradually. When people ask me what would I be if not a makeup artist, my answer would immediately be ‘a dietitian’! That’s how deep I was into trying out all the fad diets! In 2008 the Hindi movie ‘Tashan’ released and there was so much hullabaloo about Kareena Kapoor’s ‘size-zero’ figure! The movie crashed at the box-office but Kareena’s figure was spoken about by almost everyone in the film industry. Then in 2009, Kareena’s ‘Tashan’ dietician Rujuta Diwekar released her book ‘Don’t Lose Your Mind, Lose Your Weight’ which took the industry by storm! The book became the best-selling book in the non-fiction category for 2009 and continues to be on top of best-selling charts 4 years after it was published. Her clientele includes big-wigs such as industrialist Anil Ambani, Bollywood actors Kareena Kapoor,Karisma Kapoor, Anupam Kher, Richa Chadda and many more. In 2009, after the book was released, everywhere I looked I’d see women digging their faces into it – at airports, coffee shops, libraries etc and I decided to get my hands on the book to understand what was so great in it! And when I began reading it, I dint feel like putting it down until I had read all of the 279 pages. I’d discuss the book with my friends and ask (or even force) them to read it, call my father at work and tell him how he should change his eating habits to stay healthy, suggest to my brother the right ‘time’ to eat that Mc Donalds burger or a pizza and god knows what all. Today 5 years later, when I look back, I feel that this book has made a large impact on my life, in it’s own small-big way and each time I pick it up to read it again, it always feels like my first time! This post might seem like a review of the book (uhhh… sorry about that, but I had to share with you’ll it’s importance in my life) but it did help me lose weight by tweaking a few little things and helped me maintain my weight at a time when I felt I’d surely put on with the kind of food I was eating! This post is the first of a 5 part series on ‘Tips for weight loss’. All the content (No! I haven’t typed out the entire book here, hello!!! 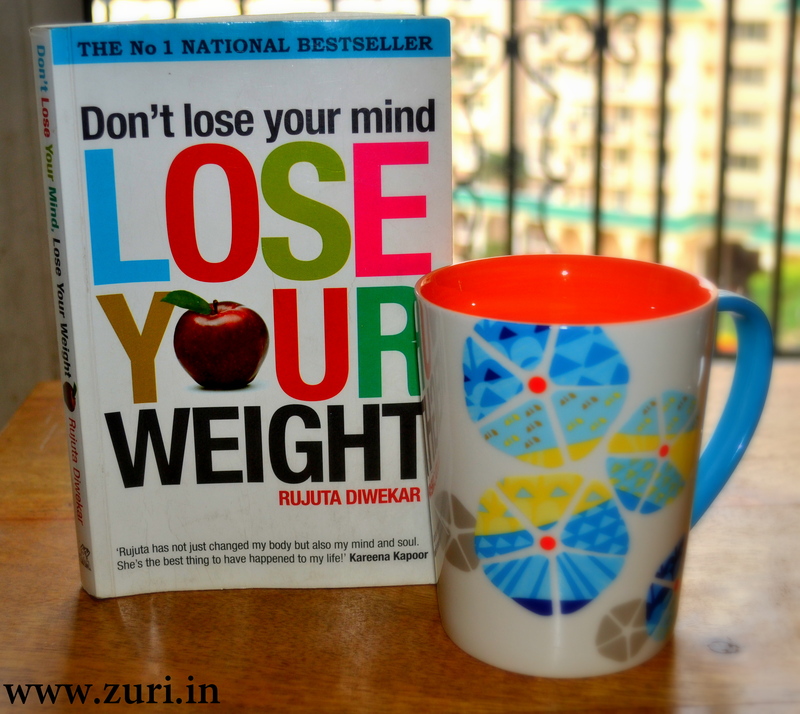 ), I mean the best parts have been taken from Rujuta’s book and summarized for women who haven’t read the book yet but have been searching the internet for some enlightenment in the field of diets and weight loss. A lot of people think that diets mean starving and punishing yourself. The holy grail truth is that diet is all about eating well, eating right and eating regularly with the focus being on nutrition and not just calories. Eating correctly has to be a lifelong commitment and there is no such thing as going ‘on’ or ‘off’ your diet! Punishing yourself by going on deprivation diets (liquid diets, low carb, high protein etc.) never works. You will lose weight, but it will all come back one day, double of what you lost. Your diet has to remain true to your genes, your likes and dislikes, your work life, your level of activity and only then does it have a good chance of working. DIET IS NOT STARVATION! All extreme diets are a sham. At the end of these diets people’s bodies and minds age and their metabolic rate is lower than ever before. Any program which discourages you from exercising is worthless. Being on a diet might help you lose weight, but without exercise we loose our muscles and bone density. The least we can do is give it 30-45 minutes of exercise for 3 days a week to keep it in good shape. A lot of people believe that as long as you exercise it’s ok to eat whatever you want. No way! Exercise is a part of adopting a better lifestyle but it is not an alternative to eating right. When you start eating healthy and exercising regularly, you will initially see a drop in your body fat but not as much in your weight. However, when you crash diet, you lose a lot of weight because your lean body weight comes down while your fat body weight remains the same and sometimes actually increases. Never ever try diets that your friends swear by. It may have worked for them, but it’s not necessary that it will work for you. When it comes to diets, it’s not one size fits all. For people who get sugar cravings post dinner and prefer eating fruits as dessert need to understand that nutrients from fruits work for us if we eat it as a meal by itself and as a morning meal or after exercise. Making a juice out of vegetables and fruits robs you of all their vitamins and minerals. Eating a fruit is a better bet any day. It helps retain vitamins, chewing provides a massage to the gums and fibre works at cleaning out cavities. Don’t forget to come back right here for the next segment of tips for weight loss.